As you can probably tell just from the title, July was a busy month! Before I leave for Malaysia, I'd like to recap some of what I've been doing here in America :). First of all, my mom won a free trip to Colorado from Focus on the Family. 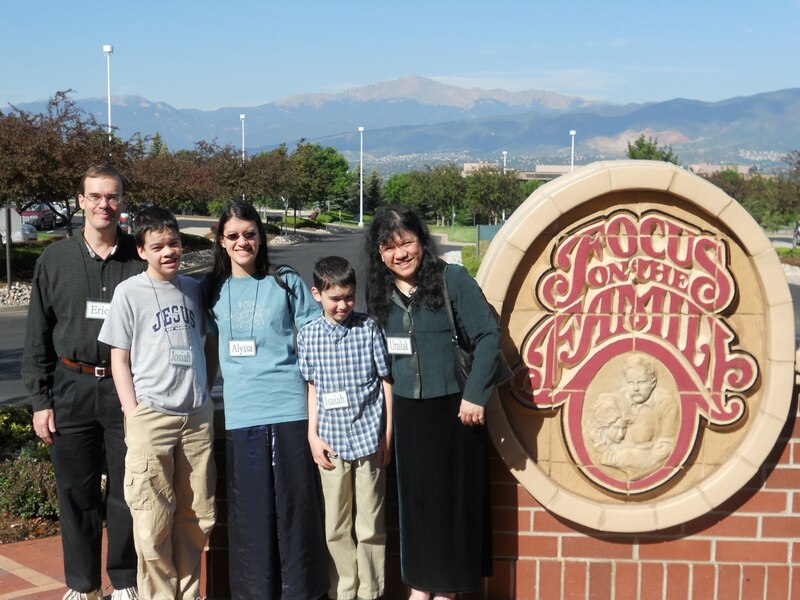 So in early July, we were able to spend four great days in Colorado Springs. This trip was one of many firsts for me. It was my first time riding on an airplane. It was my first time leaving the Northwest. 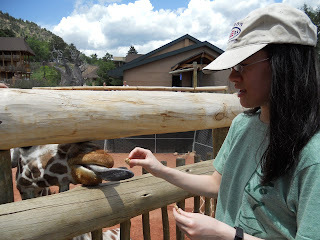 It was my first time feeding a giraffe. Yeah, here's a picture :). Feeding a giraffe at Cheyenne Mountain Zoo. I really enjoyed our tour of Focus on the Family headquarters. We got to go behind the scenes and learn how they make Adventures in Odyssey episodes. The filmmaker in me really liked the production side of things. 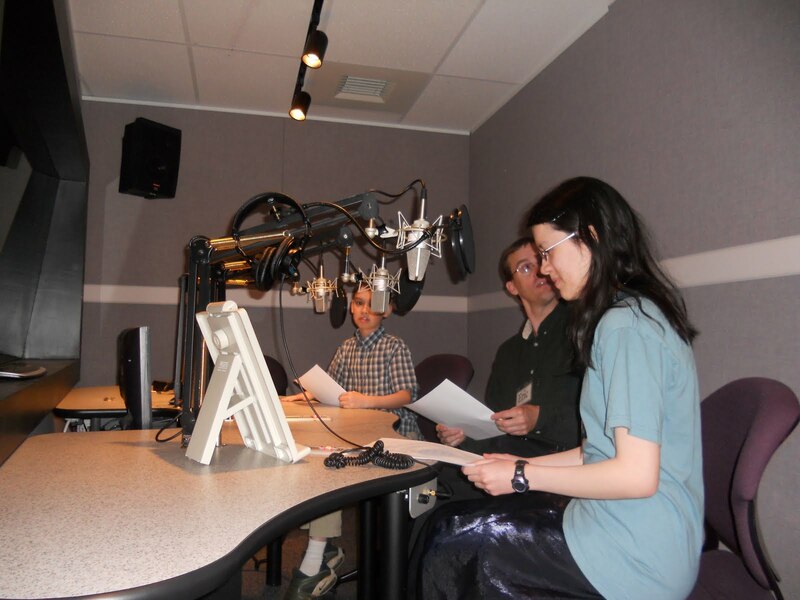 We got to record our own short episodes with nice microphones and everything. It was fun! Everyone at Focus on the Family was really nice. 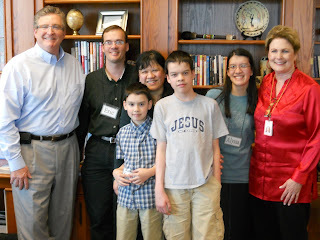 We got to have lunch with Mr. Jim Daly, the president of Focus on the Family. I was so glad that it was casual and everyone at the table had a great sense of humor (as opposed to being stiff and uptight :)). 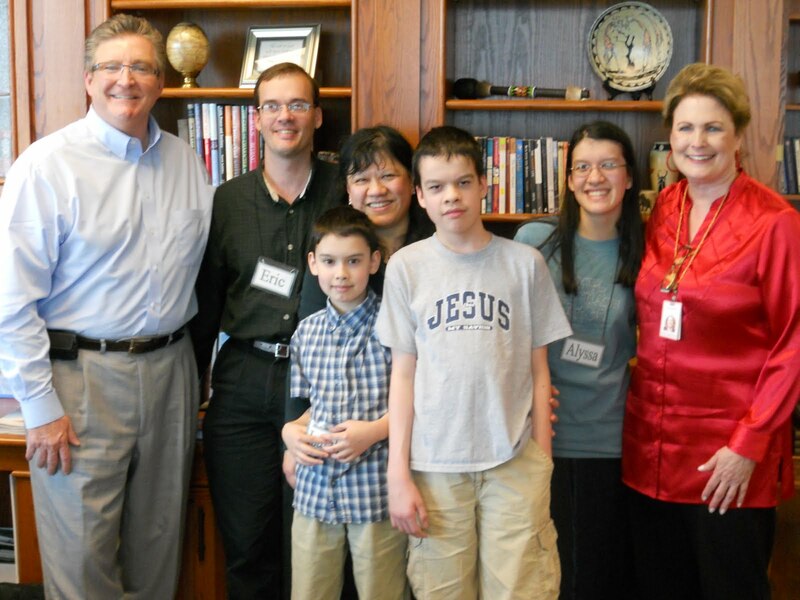 Here we are with Mr. Jim Daly and our wonderful tour guide Mrs. Suzanne Martin. At chapel (which happens once a month), Dave & Jess Ray performed their original songs. I loved it! They have such pleasant voices and a wonderful ministry. Their CD, "Music for the Radio" is only $7.50 (including shipping) and 100% of the profits goes toward buying handheld radios that broadcast the Gospel to the people of southern Sudan in their native language! Would you like to buy one for yourself? Click here to get your own copy. I really recommend it! 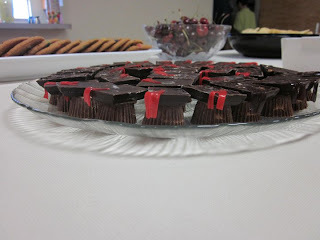 And then, in late July, I celebrated my graduation from homeschool highschool and turning 18 at the same time! My mom got up to do the introduction. Then dad played 3 worship songs on the piano. Mom went back up on stage to give her speech. We showed a slideshow of me growing up. Then it was my turn to give a speech. God graciously gave me the ability to do it without shaking or even getting that nervous (which is incredible! I've struggled with terrible shyness all my life and am so thankful to God for helping me overcome it!!!). After my speech, I shared two videos about the Logos Hope.Then both Mom and Dad joined me on stage. Mom had me repeat a pledge after her. Dad said a few words and prayed. And then I received my diploma! You'd think it was finished, right? But Dad surprised me with a song that he had written that morning!﻿ He sang and played it on the piano. I am not one to cry in public and I had determined not to cry during my graduation...but I melted into tears as Dad sang the song he'd written for me. It was so brave and sweet of him to sing it in front of everyone!!! It was now time to eat and mingle :). Mom, Aunt Annette, and I stayed up making these little caps the night (or should I say early morning ;)?) before my graduation party. I opted not to wear a real cap and gown during the ceremony. These did nicely. ﻿ Mom came up with the pretty place setting idea for the tables. 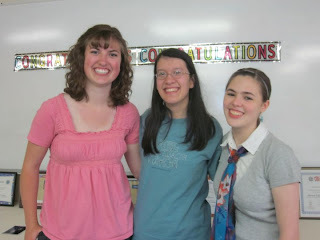 Me with two very awesome friends.